Full disclosure: I'm one of those stooges who thought Heyward was fixed at one point. On this date last year, Heyward was hitting .294/.342/.456. His swing didn't look much different. But it seemed like he might be fixed. He didn't do anything like that in 2016. He was just bad. All year. The main reason I thought Heyward might have been fixed was because he was hitting the ball hard. 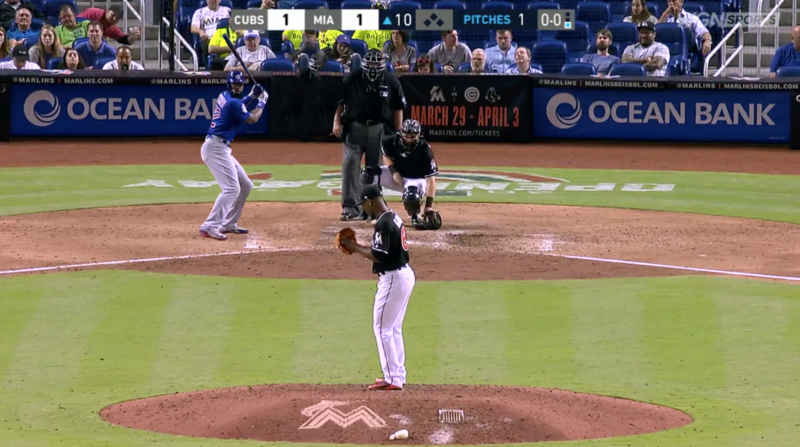 Heyward's case wasn't like what we're seeing with Ian Happ right now -- when a batter seemingly forgets how to do anything right at the plate. During Heyward's worst moments, he maintained a keen eye at the plate. He was still making contact at a very high rate. Contrary to popular belief, he didn't really have a problem with hitting too many ground balls. His GB% was lower in '16 and '17 than his career rate. Bad Heyward couldn't hit the ball hard, though. In 2015, Heyward had an average exit velocity of 89.3 mph. It dropped to 86.6 mph in 2016. So when I saw Heyward had an average exit velocity of 90.1 mph in April last year, I grew hopeful. It didn't last. Heyward finished 2017 with an average exit velocity of 86.4 mph. Heyward was basically the same as he was in 2016. To be fair, compared to his disastrous 2016, Heyward did improve some at the plate in 2017. I don't think he was really any better, but he probably was a little unlucky in 2016 -- as evidenced by his .266 BABIP. Heyward's wRC+ went up from 71 in '16 to 88 in '17. Even still, that's not good. Let's go back to last year when Heyward was hitting the ball hard and putting up good numbers. Despite what happened the rest of the year, I do think he was somewhat fixed at that point in time. He was hitting the ball hard and producing at the plate, after all. He couldn't do that at all in 2016. Maybe fixed isn't the right word. But Heyward found a way to be useful again. The problem is that it didn't stick. And if he is fixed again, it might not stick this time either. Keep that in mind for the rest of this article and the rest of Heyward's time in a Cubs uniform. He might be fixed at some point. But we've seen enough of the broken version of Heyward to always be weary that he won't stay fixed for long. Why did Heyward go from being fixed to not last year? Who knows? I think the main culprit might have been the sprained finger that sent him to the DL on May 8. It was a minor injury that shouldn't have affected him after he got back. But I think the time off snapped him out of the rhythm he'd developed at the plate. Before long, he fell back into the same bad habits at the plate. Bad Heyward was back for good. Or he could have never been fixed at all. That's always a possibility. We shouldn't ever read much out of small sample sizes. Remember that, too. There's some different going on with Heyward this time around, though. If you've followed the Cubs at all the past few years, you probably know that Heyward has had problems dealing with velocity inside. Pitchers quickly found out that it was easy to get Heyward out by throwing fastballs in on his hands. Here is the heatmap for all four-seam fastballs thrown to Heyward from right-handed pitchers last year. That's unusual. Sure, pitchers will work inside sometimes. But the inner half is where most hitters look for pitches to drive. It's much easier to pull the ball in the air when it's on the inside. If you are a left-handed hitter and pitchers can succeed by attacking you with pitches inside, you're going to have some problems. 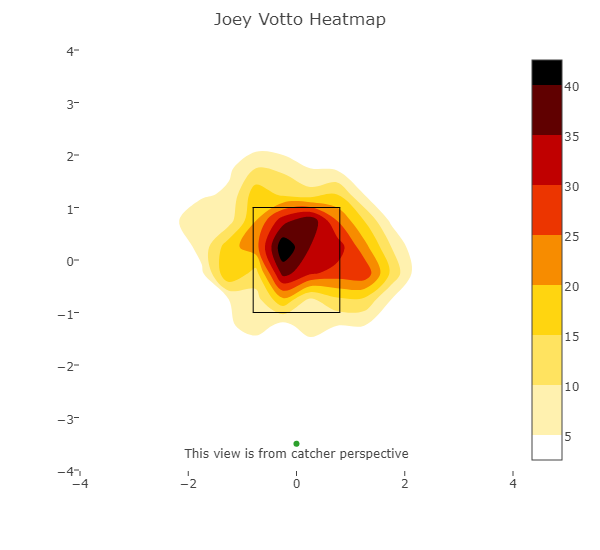 Here are Joey Votto's and Matt Carpenter's heatmaps on four-seam fastballs from right-handed pitchers last year. Joey Votto is impossible to face. There's nothing you can do. 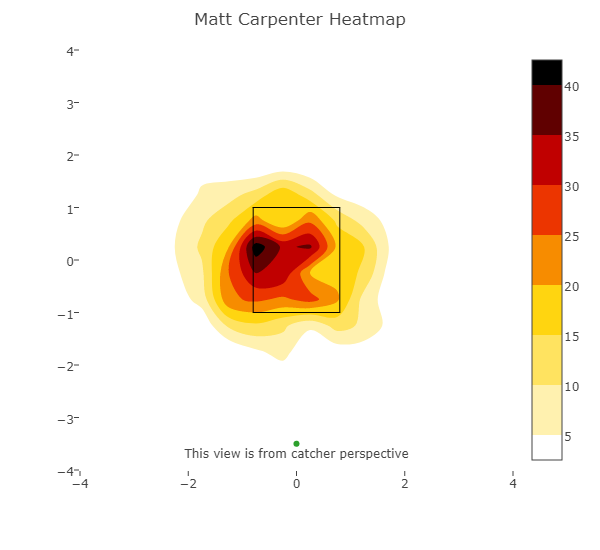 Carpenter's heatmap looks like how you'd expect a lot of lefties to be attacked. Stay away from his power. Work the outside edge. With Heyward, sure, you could work outside where he can't get to his power. But why not just work inside if he's even worse there? 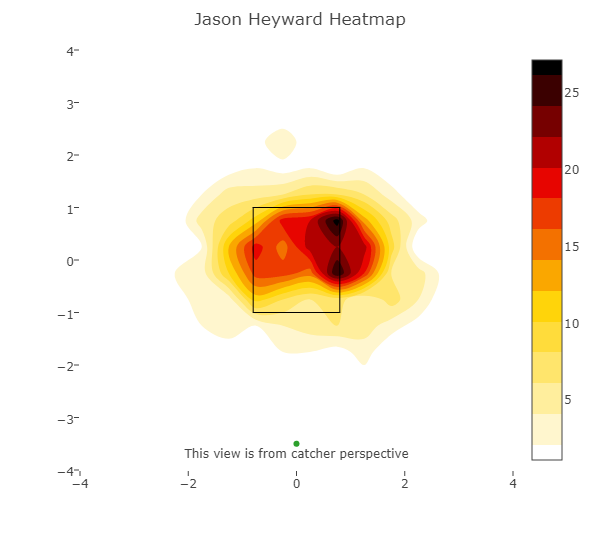 And Heyward most certainly was worse on pitches on the inside. Consider this: On all pitches on either the outside third or center third of the plate last year, Heyward slugged .512. The league average for left-handed batters was .509. On pitches on the inside third, Heyward slugged .293 last year. The league average for left-handed batters was .492. Between 2016 and 2017, Heyward's average exit velocity on pitches on the outer third was 91.0 mph. 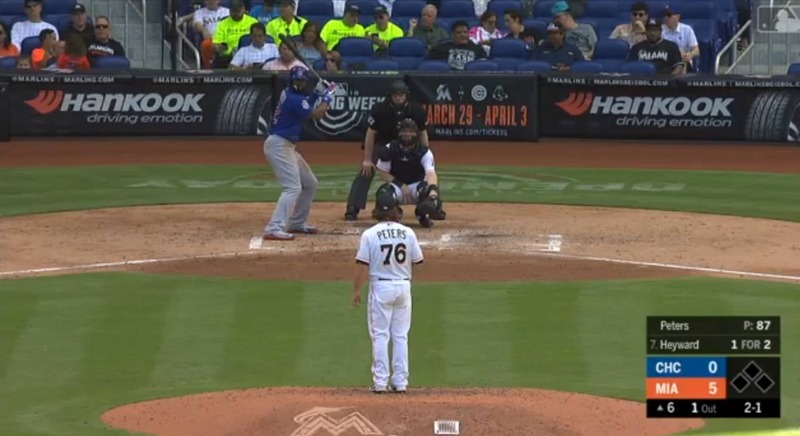 On pitches over the center of the plate, his average exit velocity was 90.2 mph. On pitches over the inner third, his average exit velocity was -- gulp -- 82.5 mph. Heyward clearly had trouble with pitches on the inside and was rightfully exploited by pitchers because of it. Going back to last April, when Heyward was putting up big numbers and hitting the ball hard, he only slugged .294 and had an average exit velocity of 85.6 mph on pitches on the inner third for the month. This lends credence to the notion that Heyward was never fixed last year and that we were just seeing noise from a small sample size. The solution this off-season? Scoot back from the plate. It can't be that easy, can it? Maybe so. Here is a screengrab from Heyward in the batter's box last year. This one comes from earlier this year. When we got a glimpse of Heyward's off-season adjustments, his swing looked much the same as we'd always seen. The actual games started and it was obvious that he was standing as far away from the plate as he possibly could. That's an actual change. How's it working out for him so far? Pretty good! Heyward's still hitting the ball hard when it's over the center third, with an average exit velocity of 91.1 mph. Despite standing so far away from the plate, he's actually hitting the ball harder when it's on the outer third, at 94.6 mph. As for the inner third? Heyward's average exit velocity is 91.1 mph there. He's slugging .643 on pitches on the inner third! In 2017, Heyward had 6 batted balls with an exit velocity of at least 100 mph on pitches on the inner third. He's already matched that total this year. Seriously, could it be this simple? I really don't know. Again, I'd caution against reading too much into small sample sizes. But this is definitely intriguing. Heyward had one fatal flaw in 2016 and 2017. He couldn't hit pitches on the inner third. He responded by backing off the plate so pitchers couldn't attack him in on his hands. Since doing so, the inner third hasn't been a problem for him. One of the reasons I think this idea might be crazy enough to work is that it wasn't just velocity inside that was hurting Heyward. In 2016 and 2017, he slugged .146 on off-speed pitches on the inner third. 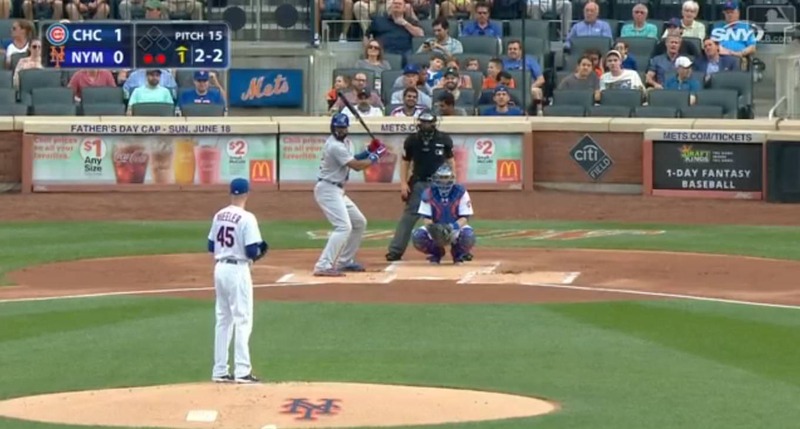 His exit velocity on such pitches was 78.5 mph. This wasn't just a funk for Heyward. This was a problem that was going to capsize his career. He couldn't hit inside pitches and pitchers knew it. Something had to change. Perhaps this was the answer all along.